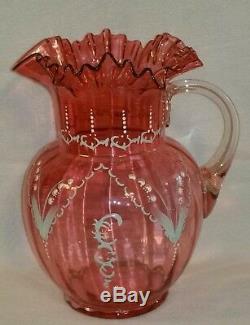 This is a wonderful antique victorian blown & enameled cranberry glass lemonade set (pitcher w/ 4 matching Tumblers), fourth quarter 19th century. The pitcher (9-3/4" high) with tooled ruffled rim and the original gilt-edged rim tumblers (4" high) show a matching enameled lily of the valley decoration. The pitcher has a clear glass applied handle. The set is in absolutely beautiful estate condition. 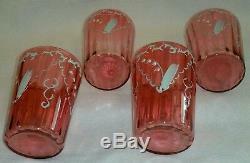 The 5 piece blown cranberry glass set with enameled decoration shows a bright shine, as shown in the photos. 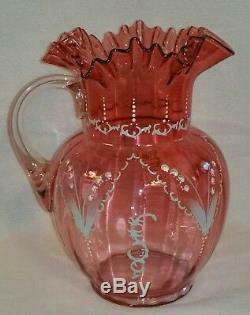 The pitcher has NO chips, NO cracks, NO repairs, and NO restoration. The interior bottom tooled foot-rim shows very faint trapped sediment, as shown in the photo. 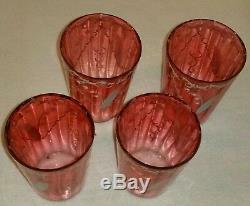 The four matching tumblers have NO cracks, NO repairs, and NO restoration. 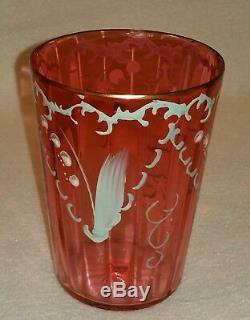 Only a couple tumblers have rim-edge pinpoint flecks, with one showing a small chip, as shown in the photo. 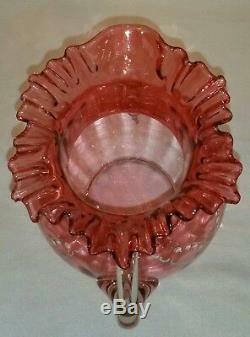 This antique victorian cranberry glass lemonade set comes from the estate of a longtime antiques dealer. 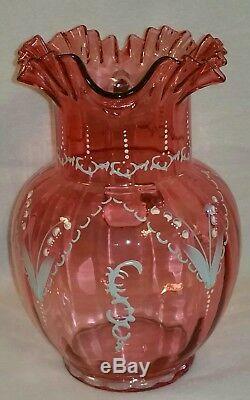 Be sure to see our other listings for more antiques from this estate!! Also, please take a moment to look at our other listings for more antiques and vintage items in various categories. Thank you for taking the time to read this listing!!! Also, we ask you to inquire with any questions and we will certainly attempt to answer those questions to your satisfaction. All of the items that we list should be considered used, vintage or antique. Therefore, use and wear should be expected with these items. We have attempted to explain and define the condition of the piece in the above description and ask that you read that carefully. If you are not sure of something or if you have any questions, please ask! We do not mark merchandise values below value or mark items as "gifts" - US and International government regulations prohibit such behavior. Please do NOT ask us to do otherwise. Most of the items I sell are antique, vintage, or used. This means they have been used. I typically do not sell what I would consider substandard or damaged items, but any item that has been used MAY show signs of use and wear. While I do inspect all items that I sell, It would be difficult to describe every minute imperfection in writing. I provide you with sharp, focused, properly exposed photographs to enhance my written description. Thank you for reading these terms and conditions! 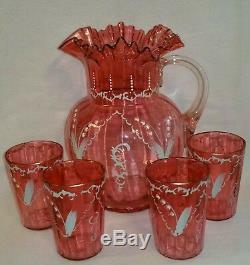 The item "Antique Victorian Lemonade Set Blown Enameled Cranberry Glass matching Tumblers" is in sale since Friday, September 29, 2017. 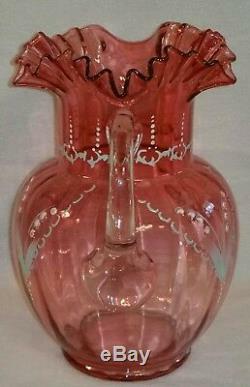 This item is in the category "Antiques\Decorative Arts\Glass\Pitchers". 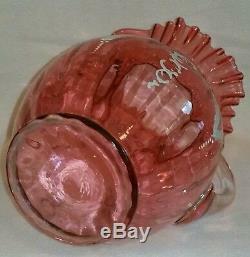 The seller is "brclrkstn" and is located in Clarkston, Michigan. This item can be shipped to United States, Canada, United Kingdom, Denmark, Romania, Slovakia, Bulgaria, Czech republic, Finland, Hungary, Latvia, Lithuania, Malta, Estonia, Australia, Greece, Portugal, Cyprus, Slovenia, Japan, Sweden, South Korea, Indonesia, Taiwan, South africa, Belgium, France, Hong Kong, Ireland, Netherlands, Poland, Spain, Italy, Germany, Austria, Israel, Mexico, New Zealand, Philippines, Singapore, Switzerland, Norway, Saudi arabia, Ukraine, United arab emirates, Qatar, Kuwait, Bahrain, Croatia, Malaysia, Brazil, Chile, Colombia, Costa rica, Panama, Trinidad and tobago, Guatemala, Honduras, Jamaica, Bahamas, Viet nam.